I’m moving to Oklahoma City in two weeks. This sort of looms large on the immediate horizon. I’m not good at organizing this sort of thing so its pretty crazy. I have an E-Foamies Extra 300 on order. 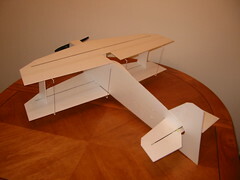 Its a rubber airplane so I can fly outside like crazy and not worry so much about destroying the airplane. I really want to get some stick time in and improve my flying. I want to start doing competitions by next year. 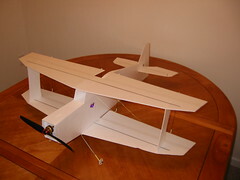 Its also my first ARF (Almost Ready to Fly). I am generally anti ARF but I understand why thats better for most people. Its also going to be nice to see how this EPP stuff behaves in thin sheets. I see a lot of potential for improvements to the Breeze using hybrid EPP/Depron construction. I have a few crashes on the Breeze now. It keeps breaking in the tail because the tail flexes too easily. I’ll need to modify the plans to help reinforce that area. The elevator needs a redesign as well. Ruby is cool. Everyone says so, all the cool kids are using it. Seriously, Duck Typing and Mixins are where its at. I seriously cannot count the number of times I wished things worked like that in Java. Its too bad that C#/.NET had to be a feature duoplication of Java. When you look at somehting like Duck Typing or Mixins either is easily a bigger win for developers than all the things you can come up with in .NET that suposedly make it better than Java. I really need a project to do in Ruby. In the spirit of free beer and open source these plans are made available under the Creative Commons Attribution-ShareAlike license. Go check out the Breeze F3P thread on RC Groups. See a video of the Breeze in flight. I wanted the parts to be easy to cut by hand since its going to be built from scratch. The number of curves and the total part count was kept to a minimum. The Breeze has an aspect ratio similar to the Donuts-Models biplanes. It has generous side area and large interplane struts for good knife edge performance. Keeping weight below the weight target will, of course, improve performance. Google bought @Last Software and now there is a free version of Sketchup. Now, this is awesome, let me tell you, its the best little CAD program I have ever used. Knock down drag out the best. You can pick it up in as little as an hour and grock it in a few days. Thats the good part. The bad part is the app is a black hole. You can import all sorts of formats into Google Sketchup, particularly AutoCAD’s DXF and DWG formats. This rocks for hobbyists because lots of plans are out there in DXF format and Sketchup is easier and cheaper than AutoCAD. The problem is there is no way to get your work back out of Google Sketchup. You can export a 2d image at an undetermined scale, thats it. Thats totally useless. Google, if anyone there is reading this, please for the love of hobbyists everywhere, give us a way to print from this thing! Ideally I want 1:1 output of a view/selection to PDF. For extra points allow us to tile or split the PDF to a particular paper size. That way you could print to a consumer printer and reassemble the pages to produce a pattern or plan. I think that functionality would cover 90% of the hobbyist’s need to get output from a CAD tool. I also don’t see it eating into Sketchup pros sales much either as I doubt most hobbyist types would spring for a copy. Now for the sketchy part. If you download the trial of Sketchup 5 Pro you can get 1:1 PDF output and export to DXF. The trial lasts just 8 hours so use it only for exporting. It can be installed side by side with Google Sketchup. It takes me about a minute to do an export to PDF and DXF so that trial is going to last a long time.